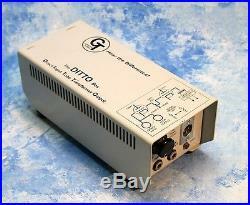 The DITTO Box (Direct Input Tube Transformer Output) was a instrument tube preamp made by Groove Tubes in the 90's that predated the GT Brick. It was essentially identical to the Brick's instrument 1/4 input, and worked the same magic for any instrument from keyboards to strings. "Fabulous Fred Mod" performed on any GT DITTO by APD, Aspen Pittman Designs. It will be done to original GT factory. Ffm specs by the company's in house service department... "Fabulous Fred Mod" was an official Groove Tubes ECN (Engineering Change Notice) that was scheduled for the next run of GT Bricks. However it was never implemented to any production run of Bricks because Fender bought GT and discontinued all the GT audio products back in 2008. As the DITTO preceded the Brick, thee were also no DITTOs that had this upgrade. And overall produces a much more linear frequency response curve... The Story behind the Fred Mod. Aspen Pittman, the owner/founder of GT negotiated a 3 month transition period so his employees could continue on their jobs with full pay and look for other employment. During this time, all development on his new projects stopped, and so he told his GT engineers to "go play" in the engineering department and come up with some factory upgrades where ever possible. As the Brick was one product Fender indicated they would continue (but didn't), that was a prime target for upgrade. One of our GT audio engineers, Fred Bova formerly with A&M studios, came up with a fabulous mod for the very popular GT Brick that corrected some original design flaws. Aspen really loved what it did for our Brick, so we named it the. Following a year of chemotherapy and with his health restored, Aspen began building his unique 32 channel all tube based live large format recording studio in the original GT factory building which he still owned. And he still uses these Brick. Ffm preamps daily at his APR (Aspens Place Recording) studios. Aspen still maintains a lab there in this building located in San Fernando (2.2 square miles of heaven surrounded by Los Angeles), and also continues to design and develop new products for APD (Aspen Pittman Designs). Your DITTO will be upgraded w/ the. At Aspen's own lab here in San Fernando (where you are welcome to set up a visit and bring your preamp w/ you). A few years ago, Aspen launched a new company, APD; Aspen Pittman Designs. These new APD line include: Aspen's patented Center Point Stereo Spacestation v.
3, a stereo powered monitor that produces a 3D stereo image everywhere in the room; a new version of his TEC award winning GT Convertible condenser mic for stage and studio, the Dual Top One (DT1) with a removable ball top for use as either a vocal or instrument mic; a unique magnetically attaching steel mesh pop filter, the PFM; and also Aspen most recently released a dual tube, dual OD pedal for guitar called the Duo-Tonic. We are now adding the. 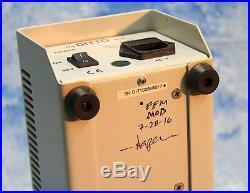 Ffm mod as a "product" in the APD lineup. There is an extensive archive of GT product catalogs, schematics and other ECN for these products on the Aspen & Associates website. Ffm tube preamps have higher gain (+10dB) and extended high (and low) frequency response... And overall MUCH flatter frequency response as compared to the original Brick circuit. We also change out the gain pot to a different type' a special order R5K reverse audio taper pot so the gain level transition is much smoother and more equal (and you don't get 90% of the gain in the last 10% of the pot's travel, but rather, an improved equal and gradual gain change). 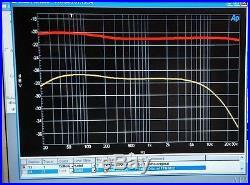 See the attached "before and after" gain and frequency response graph from our Audio Precision computer test systems here in our APD Labs. The top RED line is the DITTO. Ffm gain and frequency curve, while the bottom Yellow was teh same DITTO before the. Ffm DITTO has a near perfect frequency response from 20Hz to 20+KHz, AND a noticeable gain increase over the stock DITTO (b/w +6 and +13dB). Of coarse what you do not see on this before/after graph is how much better the DITTO sounds and performs! Your DITTO should be in good working order when you send it to us, but if not we can also repair it in this process. You will also get a notation on the bottom showing the date and tech who upgraded your DITTO box. 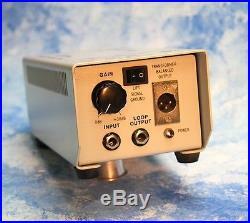 NOTE: if your DITTO (or ANY other GT audio device, ViPRE, Glory Compressor, SuPRE or GT amp) is not in good working order and/or need major repair, we highly recommend Paul Morte Technical Services in Orange California. We are not a service center , they are! And BTW, they do that job very well at reasonable prices. "Fabulous Fred Mod" is pretty extensive and requires total disassembly and removal of the PCB (printed circuit board), which we modify heavily by hand. It takes about 1.5 hours to perform the upgrade and includes many new specialized parts, which are added and/or substituted. 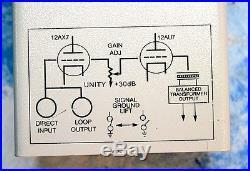 This mod also upgrades the GAIN pot to a special reverse audio tapper pot that allows a much finer gain adjustment. So, instead of all the gain in the last 1/4 of the pot, it is even thru out the range... And it actually improves the sound a too! Please note we have just lowered our. Ffm upgrade as it uses a few less parts and is a slightly easier access. The item "Owners of GT's The DITTO Box tube pre our Fabulous Fred Mod now available" is in sale since Thursday, July 28, 2016. This item is in the category "Musical Instruments & Gear\Pro Audio Equipment\Preamps & Channel Strips". 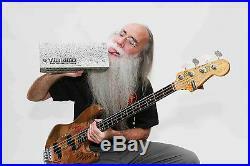 The seller is "coolestthings" and is located in San Fernando, California. This item can be shipped to United States, Canada, United Kingdom, Denmark, Romania, Slovakia, Bulgaria, Czech republic, Finland, Hungary, Latvia, Lithuania, Malta, Estonia, Australia, Greece, Portugal, Cyprus, Slovenia, Japan, China, Sweden, South Korea, Indonesia, Taiwan, Thailand, Belgium, France, Hong Kong, Ireland, Netherlands, Poland, Spain, Italy, Germany, Austria, Russian federation, Israel, Mexico, New Zealand, Philippines, Singapore, Switzerland, Norway, Saudi arabia, Ukraine, United arab emirates, Qatar, Kuwait, Bahrain, Croatia, Malaysia, Brazil, Chile, Colombia, Costa rica, Dominican republic, Panama, Trinidad and tobago.